The town of Cypress, Georgia has a long history of “bad blood.” In the midst of their growing presence in this town, Greater Hope Baptist Church will ignite fires that aren’t a symbol of “hope,” instead, they will be used to burn down the relationships that have long since been smoking beneath the surface of everyone’s nose. Miles’ and Levi’s relationship is no different. Two popular faces in the community and church, one favored by Pastor Evan Johnson and considered the prodigal son, the other has moved on with the Pastor’s daughter, Dr. Christine Johnson (the son who remained). Christine and Levi shared a past that may just end up disrupting her present. Levi is left with a great charge, but Miles will try to prove he can do it better…will both cancel out what will matter the most in a showdown of the “battle of the wills?” Or will they join together to heal a hurting family and congregation to spare the woman they love any further pain? Well, you will have to tune into Bounce TV’s network on Sunday nights at 9/8c to find out. 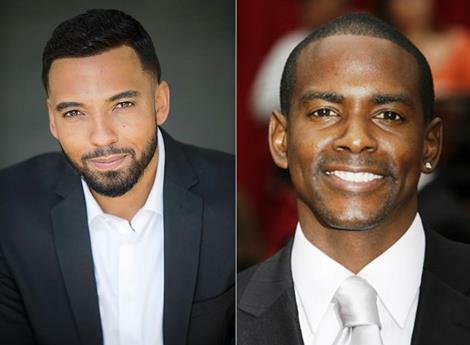 But until then, let’s see if the town’s most eligible bachelors, Miles (Keith Robinson) and Levi (Christian Keyes) will share a hint to satisfy our taste buds. Remember…Not everyone is a saint…and those who struggle aren’t necessarily a sinner. T2T: Good morning gentlemen. I have to say this is a privilege to interview you both. Since I know your time is valuable, I won’t prolong it further. Christian, I will begin with you. You have such a diverse background in entertainment; you are an actor, singer, model, producer, screenwriter, and a former fitness trainer. Tell me about your character and how did you use these talents to bring out the best or the worst in him? CHRISTIAN KEYES: Probably lending insight to all the different things Levi had to deal with like church and the money management on Wall Street. My background prepared me to work with an amazing cast and I was on a comfortable level with all of the talent. As far as comparing it to my life, I try to separate my life from the character. Not to mention, I have a different life from Levi and if I substituted my life for his it would be the wrong emotion. The script was organically written and that made it easy to stay in the moment. T2T: Well, that is very interesting. Just proves that you have an ability to tap into your characters with some amazing talent. Can’t wait to see how you channel Levi this season. Keith, same question for you. What background do you have that prepared you for your role? Tell me about your character, Miles. KEITH ROBINSON: I think having grown up in different parts of the country and having experienced different environments as a musician, it was easy to relate to my character, Miles. Unlike Christian’s character Levi, my character and I share a lot of similarities personally, so it worked out. As for what Miles will be doing this season, I love the competition between him and Levi. It is interesting to be playing this out in a church setting. Not to mention, I got to work with Kelly Price who is a lead singer in the choir…and our characters get to play both sides of the fence as saints and sinners. It was enjoyable. T2T: I can’t wait to see how this plays out. It’s clear that the both of you are going to be two of the favorites in this season’s episodes. Which leads me to my next question. How does it feel doing this first original drama series on Bounce TV? CHRISTIAN KEYES: Great! They already have some really good shows on their schedule and I have friends who are on some of these shows. So to bring something different to the table is awesome! KEITH ROBINSON: I agree. It feels good to be a part of a new network that has a fresh premise on a new curve. T2T: How do both of you think the audience will enjoy this drama? KEITH ROBINSON: That’s true. We had fun making this drama even with all the things the storyline brings into it. I know people will have just as much fun watching it as we did making it. T2T: So, now that you have our ears tuned up and into watching the Saints and Sinners; what else is new with you two? KEITH ROBINSON: Well, I have a single out entitled, “Love Somebody.” It’s available everywhere. I also just finished a 2Pac Biopic: “All Eyez on Me” in Atlanta, as well. I got some new things coming out this summer, too. Just reach out to me on Instagram, Twitter, and FaceBook at @keithsings or on my website: www.keithsings.com to keep up with my latest projects. CHRISTIAN KEYES: I love Keith’s song, by the way. I have my second novel, “Dr. Feelgood” everywhere. It’s a romantic comedy. I also have another novel, “Carl Webber Presents Ladies Night” in stores, too. I can be reached on Instagram and Twitter with @christiankeyes. Check me us out in Saints and Sinners and hit up our social networks to see what we have going on. T2T: Again, thank you gentlemen so much for this exclusive interview and a chance to hear about your amazing journey in the Saints and Sinners drama on Bounce TV. We will be locked and tuned in. So T2T readers, be sure and tune in each Sunday night at 9/8c to view what Miles and Levi have going on in Cypress.